JUGS Toss Machine is used by Ballplayers of all ages. Holds up to 14 baseballs or 10 softballs and weighs just 13 lbs. Needs only a small space to use 10 feet by 10 feet). 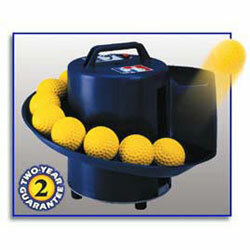 This makes the JUGS Toss Machine ideal for backyards, gyms, basements, or garages. Needs no electricity. It runs up to 8 hours, continuously, and comes with an internal rechargeable battery. (Charger included). Excellent for offensive and defensive drills, for individuals and teams. Great for developing eye-hand coordination and a quick bat.